I added a SSD to my desktop and made my existing drive as a data drive. However, it still has windows on it. Can I delete that OS since my SSD is my boot drive? You can but does the drive that you now intend to use for data only already have data on it or do you want to fully format the drive and start afresh, will explain why I ask when we know the answer. As an asides, it would be a good idea to have a back up of your C: drive for any possible emergency. Edit to add: Can I just ask that you first confirm that the computer will boot from the new installation on the SSD first. Thank you for your help. Let me expand on the info I gave you: I have been using this desktop for 2 years with the SSD installed as "C" drive (boot)..My old 500gb HD has all my old programs and data as well as Windows 10 which I updated to before I installed the SSD with a licensed copy of Windows 7 which I then updated to 10. I have had some issues with a few things not working consistently as this whole system was a custom built pc with a 2007 bios. I have now purchased a newer refurbished Dell with Windows 10 that I want to put my drives in. I just need to figure the correct way to do it without having both drives with an os on them. I have now purchased a newer refurbished Dell with Windows 10 that I want to put my drives in. Somewhat different than what you said in your OP levity apart, any drive that only has data on you can simply attach to the MB and PSU but the drive with the OS may need to be disabled as a boot device in the BIOS, you will have to hook up the drive and then restart the computer to confirm this, if the computer boots from the drive that you want it to you can then delete Windows on the old storage device from within Windows Disk Management, something that would be far easier and safer if Windows was on its own partition on the older drive. Please note that it is vital that you are 100% certain that what you intend to uninstall is on the old drive and not the new one. Thanks again for the help. Just for clarification, c: is my ssd boot drive, J: is the old drive that has several programs and data files on it. I want to get more usable space on that old drive so I want to delete the OS on it because I guess it is not necessary to run my programs. Am I correct? Edited by geno368, 12 July 2018 - 10:01 AM. 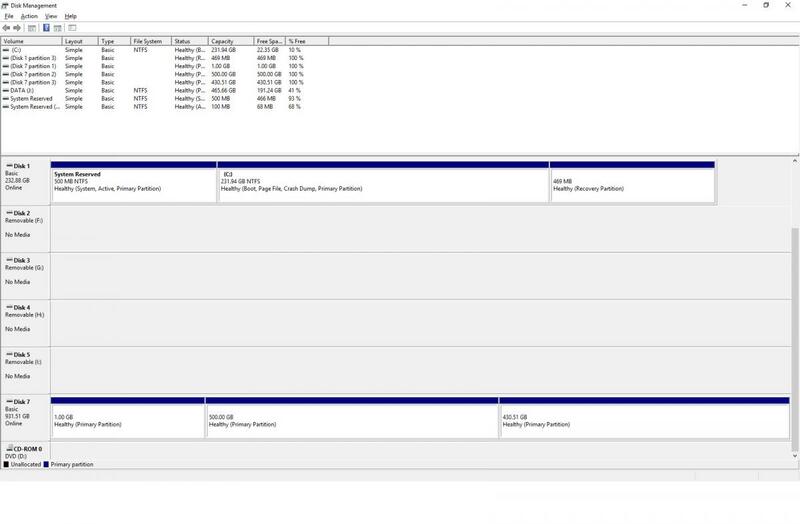 Can you upload an expanded screenshot of Windows 10 Disk Manager for us, this will show us if Windows was on its own partition on the original HDD. Access Disk Management via Run. Press the Windows+R keys to open Run, type diskmgmt.msc in the empty box then press OK. There is no J: or any other internal drive listed in Disk Manager other than the C: drive. You should forget about this for the time being as looking at your Disk Manager screenshot you have more pressing issues to take care of, you are dangerously low on free storage space on the C: drive. For Windows to be able to run efficiently and to be able to update you need to have between 20 and 25% of the partition or drive available as free storage space at all times, if you don`t you risk Windows becoming corrupt or not being able to update which puts you at risk of malware attack, data only devices or partitions should not be allowed to go below 10% as likewise your data will at some point become corrupted. I will try to move a bunch off the c drive to get more space for the time being. When I can, I will order a 1 T drive for the system I have ordered. I would appreciate your recommendations on any other way of setting this up. 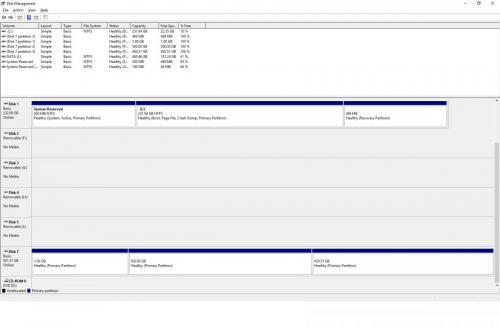 In addition, can you address the external disk 7 not being able to access?